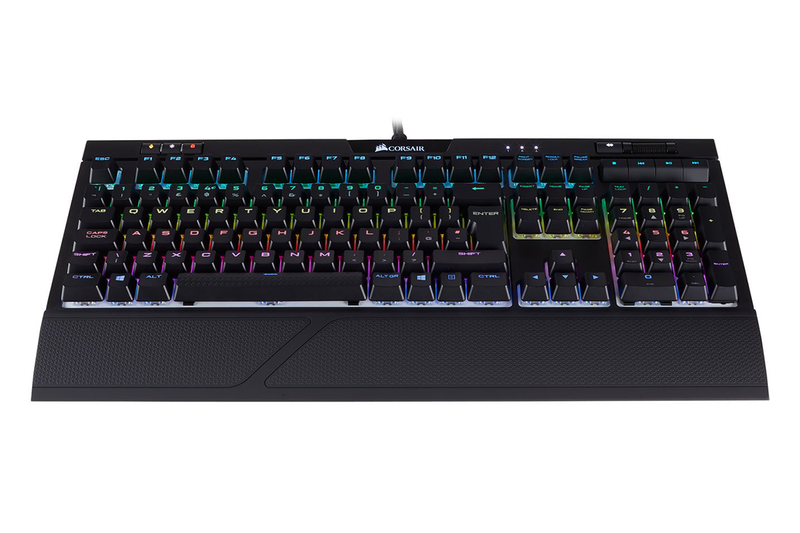 Enthusiast gamers may set their sights on Corsair's flagship mechanical keyboard, the venerable K95 RGB Platinum, but the premium price tag can serve as a sizeable obstacle. 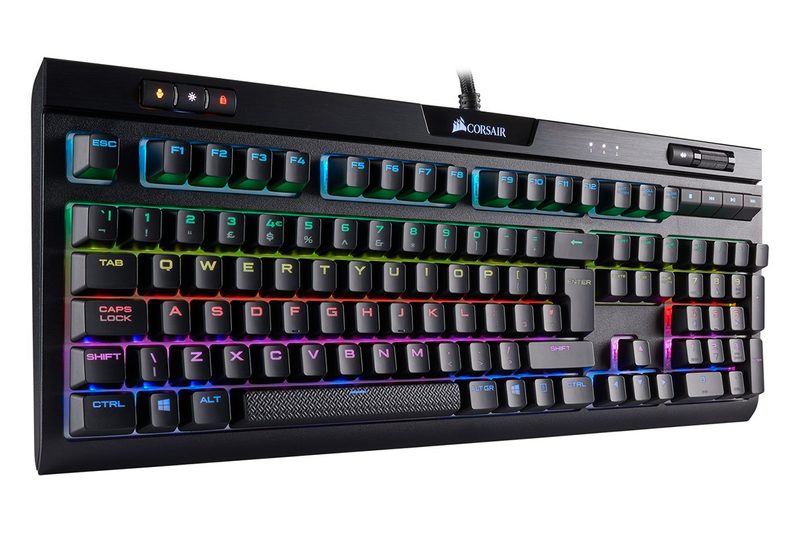 Appreciating that most users' budgets don't stretch quite that far, Corsair has been busy refreshing its second-tier offerings with MK.2 versions of the popular K70 RGB and Strafe RGB. 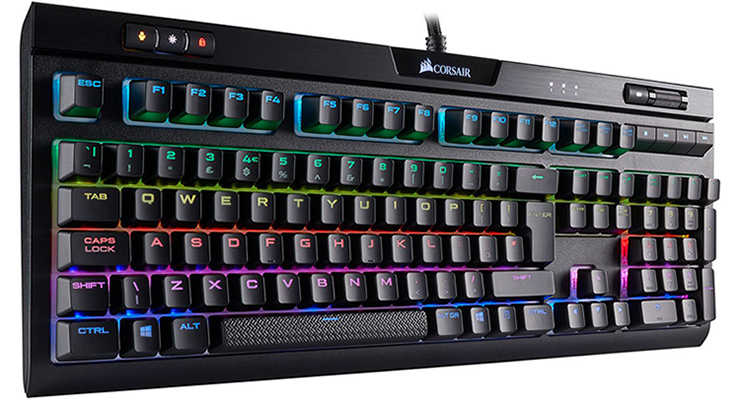 One of the nice things about a Corsair keyboard is that they all tend to maintain a familiar design aesthetic; there's no visual penalty for choosing a lower-end model. The MK.2 Strafe has premium elements such as an RGB-backlit Corsair logo on the top strip of aluminium trim, and the per-key illumination is particularly vivid thanks to a white underlying tray that looks out of place when the lights are turned off but otherwise does a good job of amplifying the effects. RGB enthusiasts will feel right at home, and Corsair's software makes light work of synchronisation between devices (more on that later), however there are some design elements that will divide audiences. 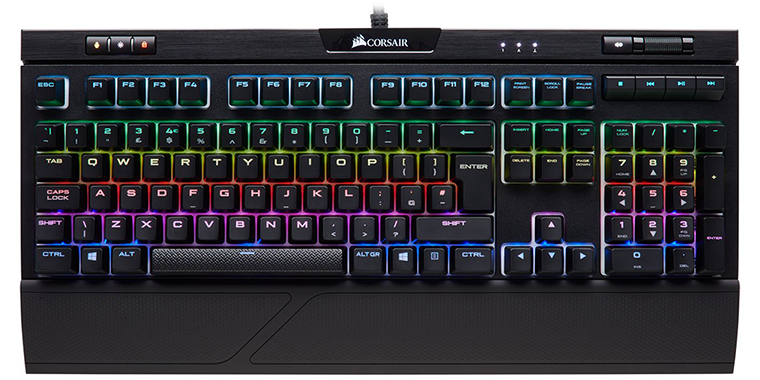 The textured spacebar is an acquired taste, I prefer a standard-sized Windows key when I'm not gaming, and though keycap fonts are a personal preference, I'm really not a fan of Corsair's chunky lettering. It reminds of those phones designed for OAPs, with huge letters you just can't miss, and while rivals appear more elegant, the Strafe RGB MK.2 comes across as relatively cluttered. Looking past the aesthetics, it's interesting to find that the lines between K70 and Strafe have been blurred for the MK.2 generation. In the past, Strafe solutions tended to omit the palm rest and dedicated multimedia keys in order to meet a more attractive price point. This time around the multimedia keys are present and on par with pricier models in the range. The four controls above the numpad - stop, back, play, forward - feel very nice and exhibit a similar amount of travel as the other keys, however the smooth volume roller is a tad cramped and scrolling down inevitably results in your finger hitting the heightened multimedia controls. No longer a pared-down alternative, Strafe RGB MK.2 features USB 2.0 passthrough, 8MB of onboard profile storage, braided cabling, n-key rollover, 100 per cent anti-ghosting, and textured FPS and MOBA keycaps in the bundle. Begs the question, how is it any different to the supposedly superior K70 RGB MK.2? The answer lies in construction quality. Whereas the K70 features an aluminium top plate, the Strafe makes do with plastic that exhibits a tiny amount of flex when pressed firmly, and the provided wrist rest is a lightweight addition that does the job without feeling luxurious. Neither of those trade-offs can be considered a deal breaker, but it's a shame the MK.2 Strafe doesn't include rubber tips on the keyboard's retractable feet; pop them open and the base becomes prone to unwanted movement. Another consideration is that Strafe key-switch options are limited to either Cherry MX Red or Cherry MX Silent. Linear reds are a known quantity, with no audible click, 4mm of travel and actuation at 2mm, but the Silent variant is interesting insofar as it requires the same 45cN operating force but lowers the travel distance to 3.7mm while reducing noise by as much as 30 per cent. In practise the keys feel a little spongy and less precise than clicky alternatives, but the Silent switch is the quietest mechanical solution we've tested, creating a cushioned sound that won't annoy everyone else in the room. The keys can still be heard clearly - silent is a loose description - but this flavour of Cherry MX is nonetheless an attractive choice for those seeking the benefits of mechanical with hardly any of the racket. 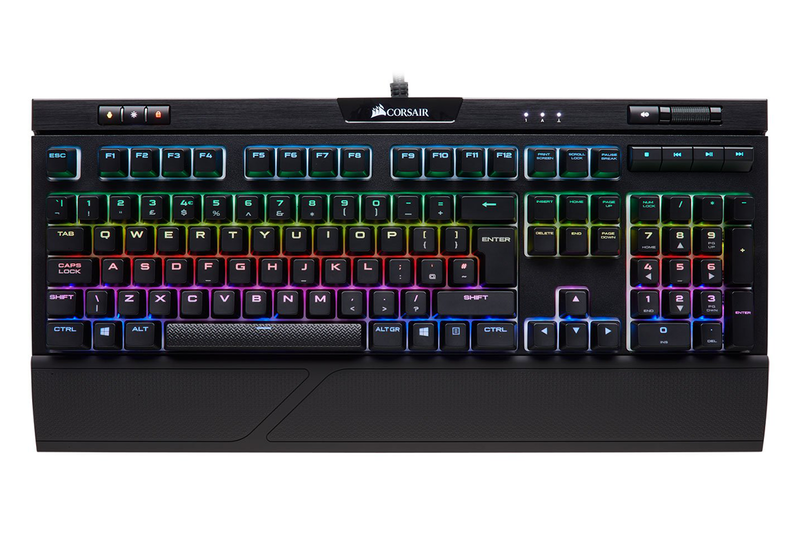 All things considered, Strafe RGB MK.2 has the makings of a well-rounded addition to the Corsair stable, but UK pricing is such that the value proposition has been lost in translation. At the time of writing, the Strafe RGB MK.2 fetches £150 at popular retailers; that's the exact same amount as the aluminium-topped K70 RGB MK.2, and only £20 less than the flagship K95. In contrast, US customers see sensible segmentation, with the Strafe MK.2, K70 MK.2, and K95 priced at around $125, $150 and $175, respectively.